For the fermentation enthusiasts out there, I’ve started a Facebook group called Irish Fermentalists. This is a friendly informative group for beginners through to ‘experts’. Please use this group to ask questions about your ferments, kombucha, kefir, pickles, cheese, yogurt, miso, ginger bugs, sauerkraut, wild sodas etc. Show us photos of what you’re making, share interesting documents in our library- and connect with other like-minded individuals. If you have cultures or scobies to share, please post that here for others who may be looking. 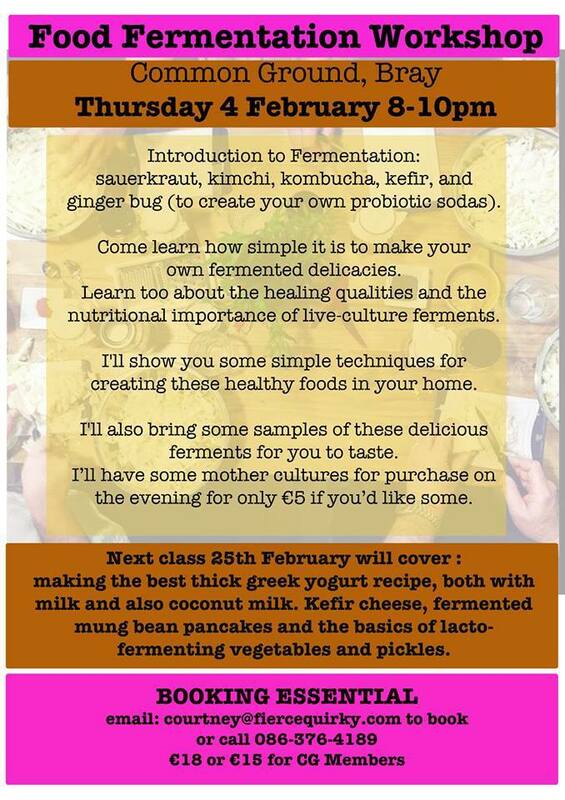 Please feel free to share your fermentation related events on this page. After many failed homemade yogurt attempts I was delighted to finally discover this method. From The Art of Fermentation by Sandor Katz here’s an online link with the process and a much more in-depth explanation. Heat the milk to at least 180°F/82°C. Heat milk slowly and gently, with frequent stirring to avoid scalding. It is possible to omit this heating step and make raw yogurt, never heating the milk above 115°F/46°C. But raw yogurt will never be as thick as yogurt from milk that has been heat-treated. Holding the milk at this high temperature, with constant stirring, will result in evaporation and concentration of milk, further contributing to a thicker end product. After heating the milk, you must allow it to cool before adding the starter culture. Once the temperature reaches 115°F/46°C, remove a cup of the milk into a cup or bowl, and stir in starter. I use 1 tablespoon of starter per quart/liter. Thoroughly mix the starter with the cup of heated milk; once it is fully dissolved, mix it back into the full pot of heated milk. Then transfer cultured milk to preheated jars, seal, and place in the incubation chamber, leaving it to ferment undisturbed. Incubated at 115°F/46°C, yogurt will coagulate within about three hours, but if left too long it can easily curdle. I prefer to ferment it a bit more slowly at a slightly lower temperature, four to eight hours at a more forgiving 110°F/43°C. Even longer fermentations can yield more tangy flavor and fuller digestion of lactose. -My favourite live commercial starter is Mossfield’s organic yogurt. I buy this and then freeze it into smaller portions. -Less is more! I use only 1 tablespoon of starter to every litre of milk. Many recipes recommend a cup or more. I’ve found better results and a thicker yogurt with less. -I find a huge difference in flavour of the finished yogurt from using different commercial bio-live yogurts. Some are more tart, some more smooth, etc. -Use the best quality milk you can find. Full fat is always best. Organic. It need not be raw milk though as you are effectively pasteurizing it before you inoculate it with the new bacteria. I personally do a large batch at a time and fill a 5 litre cast iron Le Creuset heavy pot with the milk. It helps to hold the heat in, and doesn’t burn the milk on the bottom easily. I then put this into my food dehydrator to incubate, keeping the temperature at around 110°F/43°C for 6-8 hours. If you don’t have a large food dehydrator, it isn’t necessary and you can use an insulated cooler, a thermos, an oven with just the pilot light on, etc. Many other options available online. Add 1-2 tablespoons of milk kefir grains to a litre of milk. Or less grains for less milk. Use the best quality milk you can find. Organic full fat cow’s or goat’s milk is best. Your grains will multiply quickly with pasteurised milk, so give away or compost the excess grains. Or experiment with them! I always keep some excess grains in a jam jar in the fridge covered in milk, with a secure lid. In the fridge the cold slows down the fermentation and I change the milk once a week. I strain out the liquid kefir and drink it and cover again in fresh milk. This way I’ve got some grains backed up should anything happen to the ones in use! 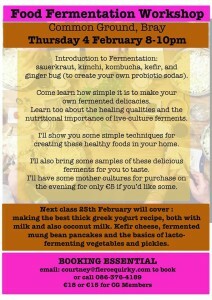 If I am not ready to make or use the freshly made kefir I add it to a litre bottle in the fridge. I top this up each day with the kefir I’ve made until I am ready to use it. But a good idea would be to make the amount you or your family would like to consume each day. -to soak my porridge oats the night before breakfast the next day. I add some dried cherries, coconut, banana, or maple syrup. -to soak in flour for pancakes the next day. Although many people seem to like just taking a shot of it when needed, or mixing with juice. I have also dehydrated some grains to preserve them and have them as back up. They are easy to re-constitute. I can post you some fresh milk kefir grains or dehydrated milk kefir grains here. I can’t stop raving about this recipe. Its become a staple in my diet. Its so healthy and versatile and once fermented it seems to keep very well in the fridge. Perfect then to mix with whatever herbs or veg I have to hand and cook up! Most of the time spent it in soaking and waiting and fermenting. So this isn’t a recipe you can cook for dinner tonight unless you’ve started the process 2 days ago. Give it a try though, I’m sure you’ll love them too! It’s easy to make this live probiotic soft cheese. A perfect replacement for Philadelphia Cream Cheese or Boursin. First you must make milk kefir. (See my post here about how-to). Strain the finished milk kefir through a square of muslin or cheesecloth. I line a strainer with the fabric and a bowl below it (to catch the whey), and pour the kefir directly into the muslin atop the strainer. Strain from the strainer into the bowl below. This can take many hours. It strains quicker if you hang it. For example tie the corners of your cheesecloth into a loose knot around a wooden spoon. Dangle the wooden spoon over the inside of a large pot. Or hang it from a kitchen cabinet doorknob. It does help if the kefir you’re adding to the muslin has been fermented for a little longer, or whey pockets are visibly forming. Either way it should be ok. You want the muslin or cheesecloth to be thick weave enough that just the whey slowly drips through. The milk solids will remain in the cheesecloth. I like to add chives, parsley, garlic and salt. If you’re using fresh herbs instead of dried the cheese will have to be eaten within 2-3 days maximum. It should last up to a week if stored in the fridge. *Note I clean my muslin directly after use with cold water first then warm soapy water in the sink. Just before using the cloth for straining cheese or yogurt- I then boil the cloth with water with a little bit of vinegar or baking soda in it, to remove any odours and to sterilise it. I finally got some more water kefir grains today from Healthy Habits in Wicklow Town. 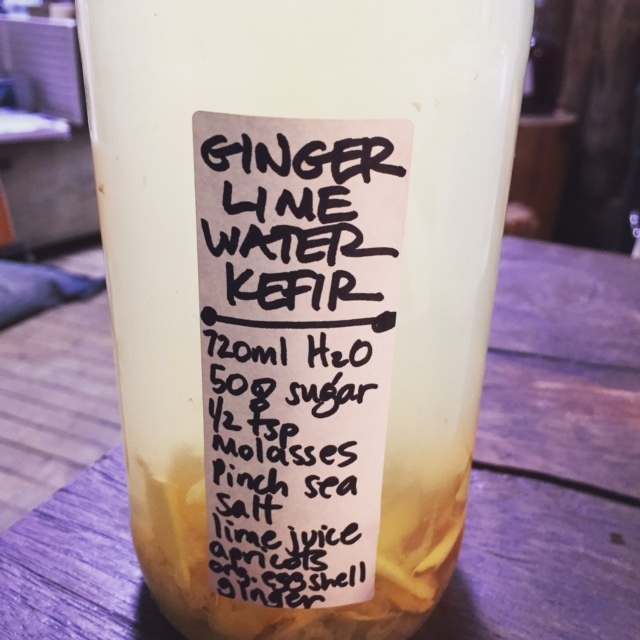 I had water kefir grains in the past but quickly felt overwhelmed from too many cultures on the go. I am now superhuman (ha, you should see my countertops!) at balancing all of my cultures, so I decided to give it another go. If you’d like to learn more about water kefir grains and read loads of recipes, one of my favourite websites is Cultures for Health. This recipe is slightly adapted from Bar Tartine’s Cortney Burn’s of San Fransisco. I highly recommend this cookbook. Makes 3 cups/ double the recipe if desired. 1-2 inches of organic fresh ginger, sliced finely. In a 1 litre non-reactive container, such as a glass milk bottle, dissolve the water and sugar. Once mixed, add in all of the other ingredients: molasses, eggshell, sea salt, lemon peel, (save the juice for later) dried fruit, sliced ginger and lastly the water kefir grains. If you add the water kefir grains loosely in a small muslin sack or bag they are much easier to remove after. Screw the lid on tight and give it a shake to mix everything. Then (importantly) leave the lid on, but unscrewed so that the carbon dioxide can escape. Or use an airlock if you have one. Bottles can and will explode if you don’t take care! If you’ve screwed the lid on, be sure to release the carbon dioxide every 6-8 hours by opening the container. Let stand in a warm place of 68-72F/ 18-22C for 48 hours. 72 hours if the room is cooler. It should be gently fizzy. Remove and discard the fruit (you can eat it) and lemon pieces and eggshell. Remove the kefir grains. Strain the liquid through a sieve to catch any other bits or kefir grains. Stir in the lemon or lime juice using more or less to taste. In Cortney’s recipe, she also adds fresh ginger juice. Transfer the liquid to flip top bottles such as glass Grolsch bottles with the rubber gasket. Leave at least 1 inch/ 2.5 cm of head space to allow the carbon dioxide to expand. Let stand at room temperature until pressure builds, about 24 hours. You can use a plastic bottle if desired to remove the possibility of explosions, but also to gauge that the pressure has built up sufficiently. Once the bottle feels hard, move to the refrigerator. Refrigerate for up to 1 month. Serve cold straight out of the bottle. I’d recommend opening the bottles with care. I open them over the sink and with a plastic jug over the top of the bottle in the event of a surprise geizer! The kefir grains need to be fed, so once removed from the mixture feed them again immediately in a sugar water mixture of ¼ cup sugar/ 50 grams to 1 quart or litre of water. Refrigerate in an airtight container for up to 4 weeks. Drain and add fresh sugar water every 7 days. Or repeat the recipe and start again!